Exhausted by their country’s near four-decade rule of militant Islamic clerics, protesters have taken to the streets of cities across Iran since last week, hoping to shake the foundations of stagnation, repression and austerity. Since the protests broke out on December 28th, the Iranian government has retaliated with violence, killing at least 26 people so far, barring many international journalists from the country and disconnecting the internet for mobile phone devices – pausing the sharing of images from within the protests internally and around the world. 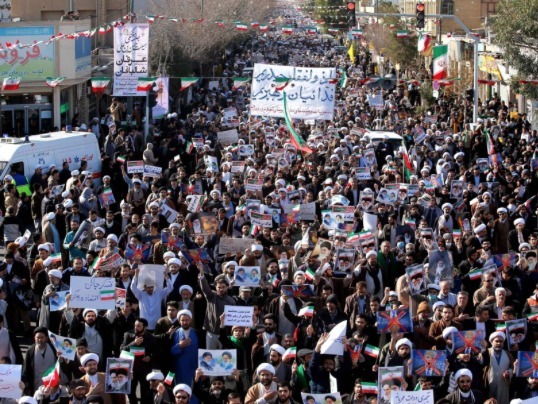 Starting outside of Tehran, in Mashhad and Qom, and quickly smearing across the country, the protests seem to differ – in terms of size, objectives and leadership – from the 2009 uprising. Key figures who led the protests that demanded the recounting of votes after the fraudulent elections 8 years ago are choosing to remain silent today, which begs closer examination as to why. As accurately noted by Greg Myre from NPR, “Iran is a complicated place, marked by multiple factions all trying to pull the country in different directions. There is one supreme cleric in charge. But there is also an elected president and robust political debate. While not a democracy, neither is Iran a dictatorship.” Making the recent protests play to a whole new tune. It’s reported that the protests were initiated by religious hardliners who sought to take advantage of the population’s economic grievances to fuel the frustration with Hassan Rouhani’s government; a regime they consider to enact too moderate a ruling. Unsurprisingly, the protests gained traction and spread across the nation, injecting hope into the disenfranchised mass and resonating with a strong consensos to ouster the President and the heavy religious grip on the country. But it’s precisely this sporadic ignition that is leading protesters’ demands to shift daily and the disorganisation of leadership to take root. In fact, no reformist leader has come out in support and many activists have spoken against the protests. All of which is skewing the momentum with which such protests need to play out. Despite the many lives lost already, Rouhani’s forces have not yet shown the sheer brutality they are capable of. Whether this is because the President is aware of the protesters’ incoherence and therefore waiting for the force of civilians to eventually simmer down, or if the hardliners have placed him under the world’s watch is still unknown. What is clear is that for a true uprising and a hoped ousting of the current government, protesters must unite, reform, align demands and create a stable organisational team of leaders to guide them forward. It is encouraging that North Korea appears to be open to dialogue with the South; hopefully, that is one New Years promise that can be kept.